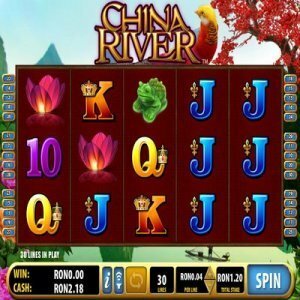 [miau] The slot game China River is a non-progressive slot that is a five-reel game with 30 pay lines and has several different features. It has wild symbols, free spins, and the maximum jackpot allowed is $1000. This game was created by Bally Technologies Casinos. This is a China themed game, based on a theme of going down the river in China. Since many slot games have their own particular themes, this seems to be a decent one and fits this game very well. There are also Chinese symbols throughout the game that have different meanings. The different symbols mean anything from Luck to purity, longevity, and wealth. The Chinese characters that are in red, are meant for wealth, and include a golden goblet, a pink lotus flower, a green money frog, as well as a round coin boasting the Chinese pattern that symbolizes longevity on it. There are some poker cards that are very colorful, and the cards are aces, jacks, queens, kings, nines, and tens. A different sum is available to win for each of these symbols or cards. This game also includes bonus free spins, which are a great benefit for anyone playing a slot game; as it allows you extra chances to win, and many combinations to win with. The bets start at a minimum of $0.30 and can go up to $30. With such a small betting amount available, it allows those who are looking to play for fun, to play without breaking the bank. Those who are looking to truly win, can also up their bets and have fun, while adding to the possibility of a big win. After the game begins, your goal is to find the golden pheasant, which can substitute for any other symbol, if you get one or more. As for the wild golden pheasant, it only can appear on the reels 2-5. 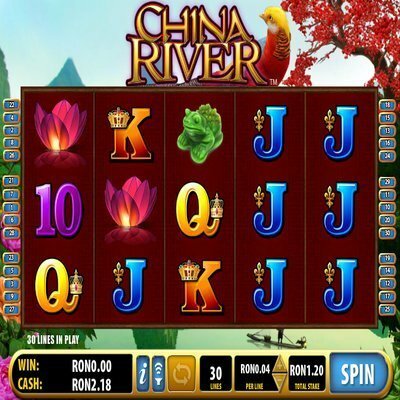 As for the free spins that are available on this slot game, you can activate the feature if you get anywhere from 3-5 coins that have Chinese longevity patterns, and are on the winning pay line. If you have a play with any of these specific winning combinations, you’ll be awarded 8, 10, or 15 free bonus games. Another great feature is that the free games can be won on multiple lines, allowing you to win even more free games, with only that one hit. An even greater feature is that any winnings that you get from the games are doubled, and the free spins can also be re-triggered while they are still going. For those who don’t want to put all the effort into clicking through the spins, you can use the auto play option for convenience. This feature will allow you to play up to 25 spins if you want, in multiples of 5, and this is done automatically. When you’re ready to leave the auto play, all you have to do is click the spin button, and it cancels the auto play, then you can begin doing it manually. Even if you can’t understand Chinese writing or language, this game can be lots of fun. By doing a quick study of the rules, you can quickly begin to play, and even work towards the $1000 jackpot.